With Britain enjoying, or enduring, its longest heatwave in decades, Red Tiger Gaming has joined in the fun with a beach based beauty of an online slot. Head to the golden sands and azure sea of the Tiki Fruits online slot. There are succulent melons, grapes and cherries on this cheery slots game, which will make your mouth water as you hit the reels. A tribal totem pole oversees the action in this tropical cartoonish title, which uses a cluster pays type mechanic. There are eight reels and ten paylines waiting for your attention, not to mention the chance to win up to 2,000 times your stake. If you want to know whether the brand new Tiki Fruits online slot is any good, read on. This online slot review takes a look at how to play, what features are on offer and everything else you need to know. Take a look at SpinCazino’s Tiki Fruits slot review. What is Tiki Fruits Like to Play? This is a cheery, sunny game that will put a smile on your face as soon as you launch it. The action takes place on an idyllic South Pacific beach. The ukulele music drifts in the background and the fruit on the reels looks good enough to eat. The reels spin smoothly and the winning fruits often sweep from there into the mouths of the totem pole figures. From there, the figure spits them into the bonus meters in a fluid motion, adding to the playful nature of the game. This is certainly a good time game, rather than an in depth adventure. You come here for the fun, not for the story, and that’s fine. You need this games, just as much as you need those that are more complicated and deep. First of all you need to find a UK casino site that offers games from Red Tiger Gaming. Spins Royale is a great place to start. Its game selection is fantastic, with products from Red Tiger Gaming and a range of other games developers. It even provides exclusive online slots. In addition, you can take advantage of a welcome bonus of 25 free spins on Starburst for each of your first £10 deposits. Hit the link above to visit Spins Royale now. Sign up, fund your account and then you can search out the Tiki Fruits online slot. Once you are ready to bring the sunshine into your life, you can get going. The game itself is really simple. Set your stake and hit spin. And that’s it. You pick up wins with clusters of similar symbols, horizontally and vertically. Once they leap off the board, more symbols drop to take their place, and keep doing so until they fail to make a winning cluster. The meters to the side of the reels house the winning fruit symbols. When a cluster forms of fruit, they fly off to the relevant meter. Once you fill that up, you win a prize. The totem pole figures can even help you out by adding some of their own to the meters. Your Tiki Fruits free spins arrive when you fill the meter dedicated to the coconut cocktail. These can help you fill up those meters, and the totem pole is even more likely to send more symbols that way. The number of free spins is always random, which keeps the excitement going! Red Tiger Gaming is renowned for its stunning looking online slots. The firm launched in 2014, headed by a group of slots fans with long term experience in the virtual casino game. Red Tiger continues to grow, bringing together a team of, in its words, “mathematicians, graphic designers, software developers, audio engineers, gambling experts, QAs, account managers and secret magicians” to produce its games. The gaming firm, based on the Isle of Man, is known for both slots and table games. It boasts a long list of successful titles, including Dragon’s Luck Stack, Fortune Charm and Treasure Mine. Why Play at Spins Royale? If you want to give Tiki Fruits a whirl, visit Spins Royale today. Although the site isn’t fully mobile optimised, the important bits are all there. A very good welcome bonus that you will actually use is a great start, and you’ll never tire of its game selection. 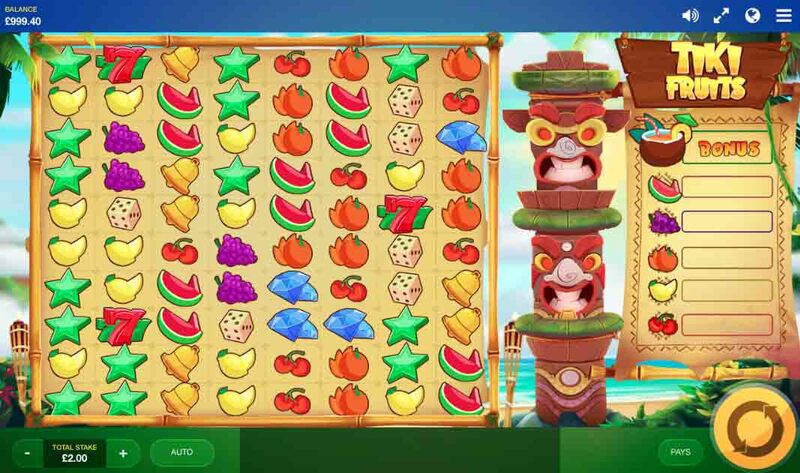 You can read SpinCazino’s Spins Royale review here, and hit the link below to visit now and get playing the sunny, funny reels of Tiki Fruits. If you like Tiki Fruits, you could check out Aloha! Cluster Pays buy NetEnt. This follows a similar Polynesian theme and is a great way of enjoying the relaxing beach atmosphere from the comfort of your own home.